Liquid calcium chloride is a soluble calcium compound and is used for many purposes. Two of the most common uses of a calcium chloride source are the production of many other calcium salts and frost resistance. Unlike other calcium compounds, calcium chloride easily produces calcium ions. These free calcium ions can react with other elements to form new compounds. This process takes place continuously in the soil, where calcium is needed for many important activities. 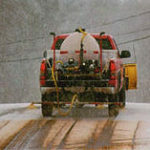 The source of liquid calcium chloride can also be used to stabilize road dust. It is used in the manufacturing industry to accelerate the various processes. The plastics industry uses calcium chloride to make solid and solid products. In the context of soil fertilization and hardening, calcium chloride is used as the calcium source with calcium carbonate and other calcium salts. It is very effective and totally harmless to fruits and vegetables. The source of liquid calcium chloride acts as a frost resistance. It has extraordinary physical and chemical properties that make it a special compound. It is used to precipitate other compounds because it is soluble. It is also used as a drying agent in many chemical reactions as it absorbs moisture very quickly. Liquid calcium chloride is also used to pre-wet dry products such as rock salt and sand to improve performance. The moist salt is at the surface and the “dispersion” of the circulation is reduced, saving material and environmental benefits with less material in the shoulder. Liquid calcium activates the salt process in brine and provides a maximum temperature. It also helps with the performance. It will not use so much dry matter and what it uses will work at much lower temperatures than normal salt without pre-wetting. Typically, liquid calcium is sprayed directly in the centrifuge just before the salt is spread over the desired surface to be treated.